I don’t understand. How can beauty thrive in such hopelessness? I asked myself this as I tried not to gag, as I step through the slums of Santo Domingo – El Caliche, Barrio Capotillo – climbing through narrow, crooked steps to visit a Compassion Sponsored Family, a path that wreaked of waste, as I steadied my steps to walk around ground soiled by poverty’s curse. I felt ashamed I might start hurling — not because I was offended by it — but the last remnants my own childhood trauma PTSD — the lingering effects of a nervous system made highly sensitive by anxiety has given me a very strong sense of smell. My body automatically responds in ways I cannot control. I didn’t want any of the residents who were watching me walk in a group of Christian Americans through the neighborhood they called home to be feel anything but respect and dignity. 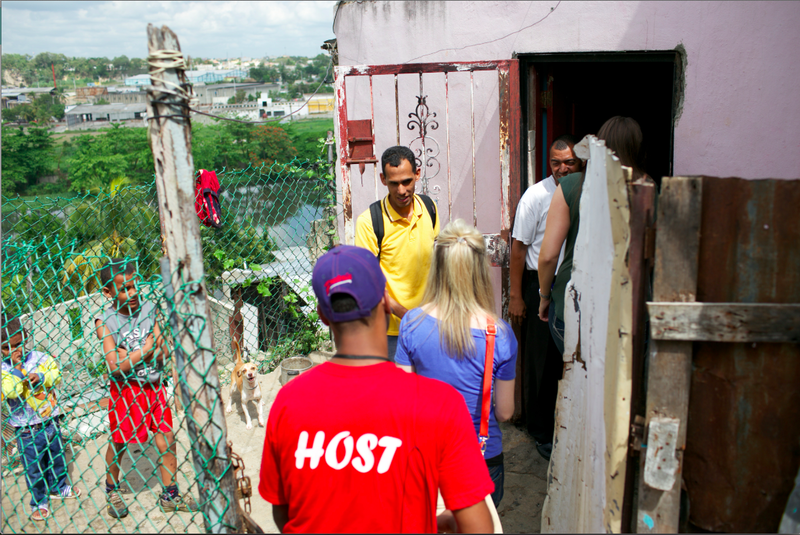 Because I know Jesus walks here among the slums every day to touch and love those He calls beloved. Jesus comes to them every day through the hands and feet of Dominican men and women who are the Compassion workers. 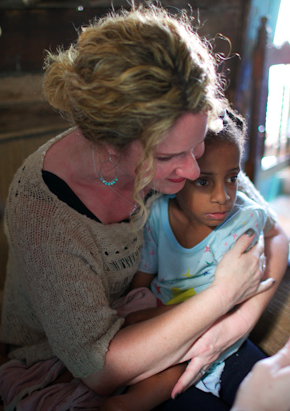 They walk arm in arm with Compassion Sponsors they have never met — who have chosen to love these children in His name. Compassion Mentors matched with Sponsored children walk here among the slums EVERY DAY to visit the mothers, father and siblings of sponsored children. For hours, one house, one family after another. 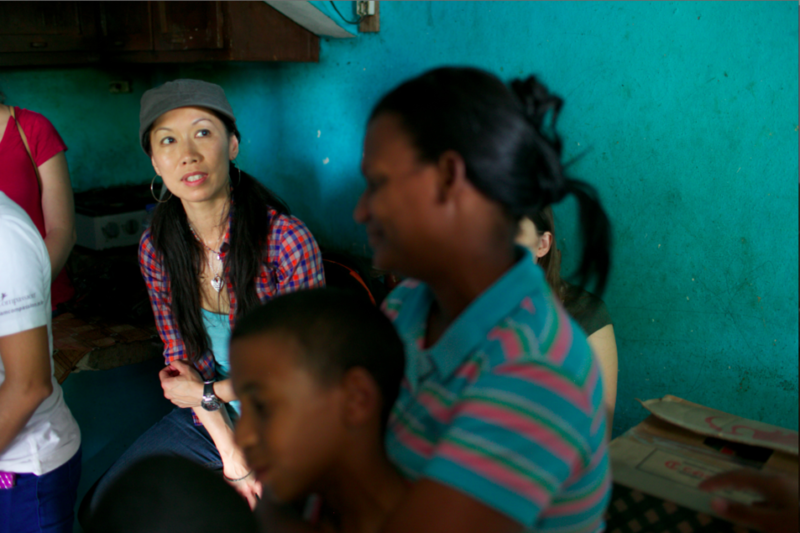 In this area, I learned each Compassion Mentor in the Child Survival Program visits 25 mothers and their babies. They do hours of home visits each day to see them all. Why? Because love is not a consolation. Love is the Light of Christ. I feel so happy to be here. A deep sense of honor to walk the steps my Compassion brothers and sisters walk. I feel so unworthy to come visit and gather pearls and diamonds — the beautiful stories of little boys and girls and the mothers and fathers who courageously love them so fiercely while suffering in the clutches of poverty. I feel unworthy because Compassion workers have been been toiling day after day — under the scorching sun for years — to mine these diamonds: hearts of little boys and girls and the families that are thriving. “The kingdom of heaven is like a treasure hidden in the field, which a man found… and from joy over it he sells all he has and buys that field. Beads of sweat pour from my body, as I pray desperately — Lord Jesus, empower me right now. Like my Compassion brothers and sisters. They are so beautiful. Compassion Child Ronnie, sporting red and blue stripes, stole my heart earlier that morning when he tapped my shoulder to hug me at the Compassion Center. “Mi nombre es Ronnie!” he said. “Mi nombre es Bonnie!” I said. Then, we both laughed. How can so much love pour out of a world cold as stone? Because love is not a consolation. Love is the Light of Christ. “Good!” I flashed a thumbs up. 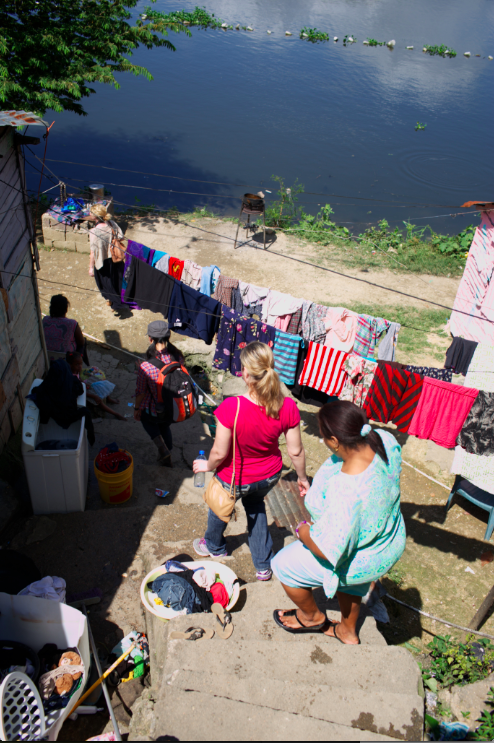 We both climbed higher and higher to catch up with the rest of the group Holley Gerth, Lisa Leonard, and Ruth Soukup — to enter single file into the home of Compassion Child Saulo. There I met Saulo’s father Luis and his mother — along with Saulo’s three younger brothers. We were all shocked and audibly gasped when Luis told us he graduated from university with an MBA. How can this be? As I sat there among abject poverty, worse than what we’d seen earlier in the week (they don’t have reliable electricity. often days without power, lack of safe drinking water) — my eyes unable to rest on a spot that wasn’t broken, torn or crumbled — I realized this can very well be my home, if I was born in the Dominican Republic. 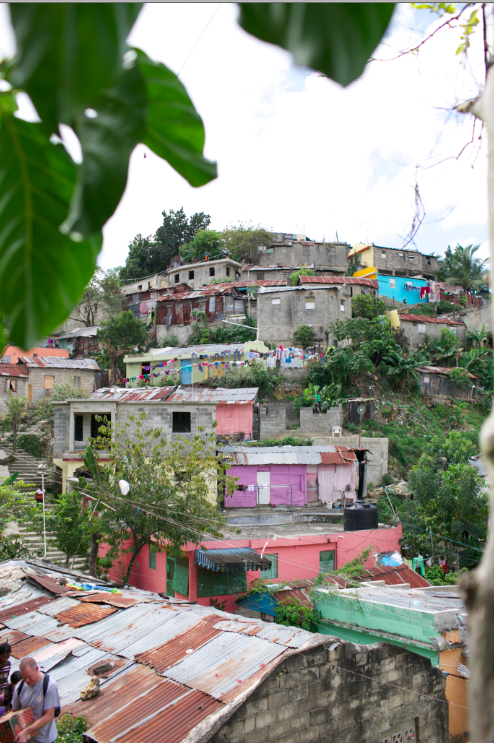 A college educated man or woman in the Dominican Republic is not exempt from the poverty. Corruption. Luis tells me, looking into my eyes. Government corruption. Political corruption. Jobs are paid for — by relationship. Who you know determines whether poverty becomes your address. 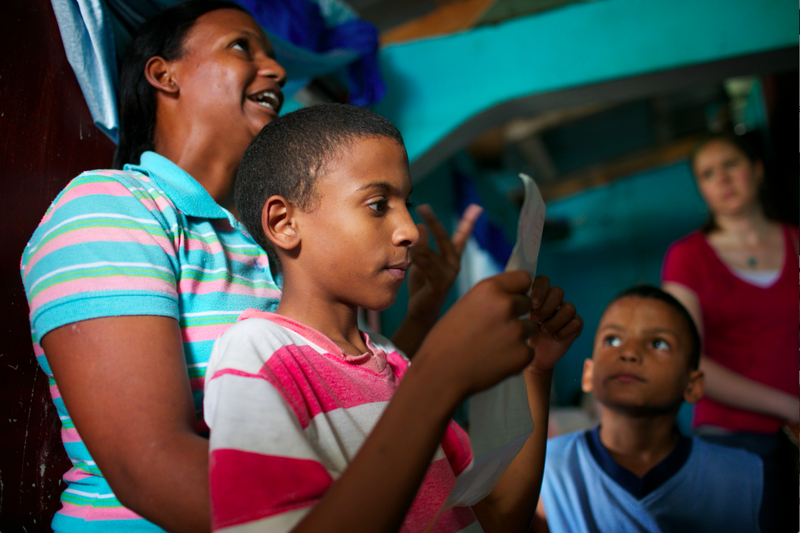 Saulo’s mother tells us with tears in her voice they were about to make the terrifying, heart-breaking decision to take Saulo out of school because they were unable to afford pencils, notebooks and pens. But, Jesus knows this family’s address. Jesus has a network of His people in Compassion. Someone chose to sponsor Saulo. You can choose to be part of God’s network of love too. Become a sponsor. Thanks to a Compassion Sponsor, Saulo goes to school — and he comes back home to teach his brothers all the materials he learned. And the beautiful thing is this: Compassion-partnered churches open their doors to unsponsored siblings for worship and recreational activities like sports, music and art. 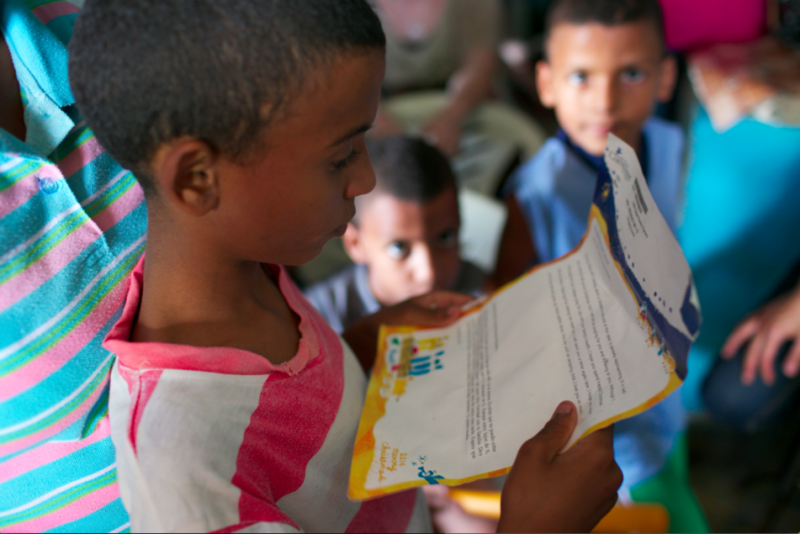 Watching Saulo eagerly retrieve a letter from his Sponsor to show us (the whole family treasures and reads these letters!) — then seeing him proudly return to show us his well-worn workbook he uses to teach his brothers — and seeing how loving and affectionate the brothers are with each other, my mommy heart bursts with joy and pride for Luis and his wife. I want to cheer for the Saulo’s sponsor! Yes. Yes. YES. The whole family nods. 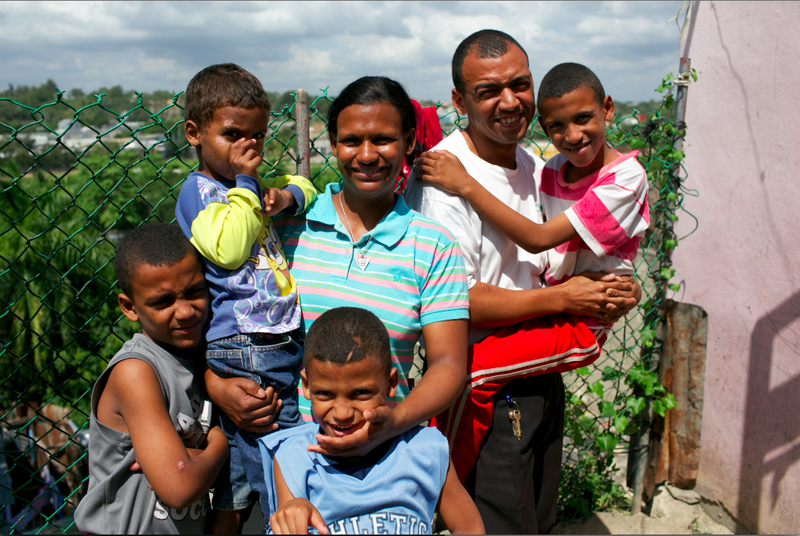 Luis, his wife, Saulo and his three brothers reach for each other’s hands and ours. They tell us they hold hands to make a circle whenever they pray. I am emboldened by their love. With bowed heads, I lifted my voice loud and strong with my Compassion brothers and sisters. We ask God to give Luis a job. I ask you now to stop and pray for Luis and his beautiful family. Pray boldly. Let’s ask God for what this family needs: a job. You are a pearl. You are a diamond — beyond value. You are worth it. You are loved. Become a sponsor today. Don’t hesitate. Be His voice of love. 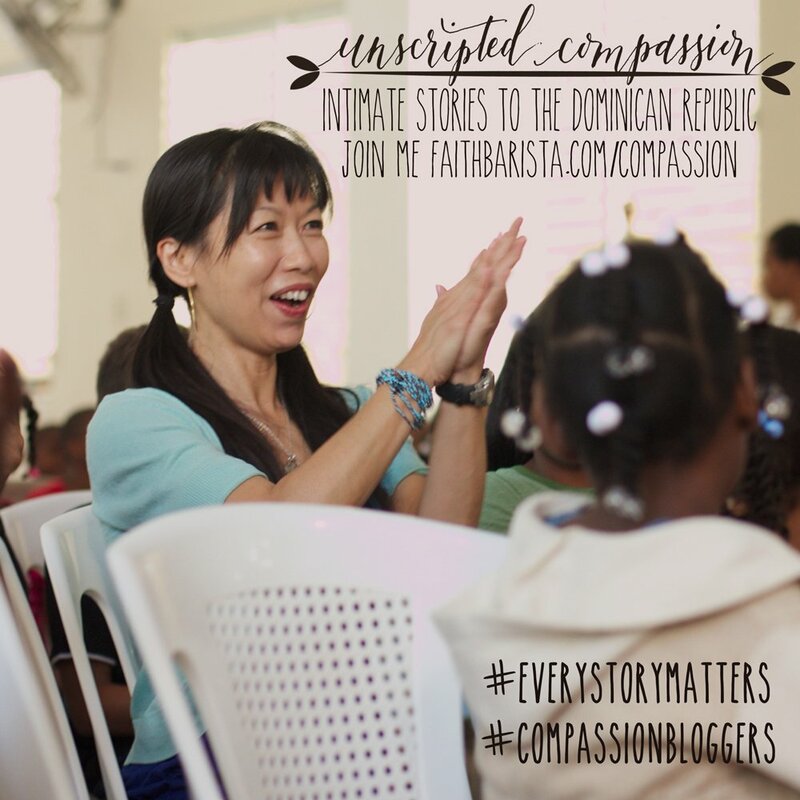 As I’m writing this, 68 children sponsored through the Dominican #CompassionBloggers! See them all here. Thank you! p.s. Will you take just a few seconds and share this post on Facebook? WAIT! The day wasn’t over. We went on to meet Elsa and Jazmin. 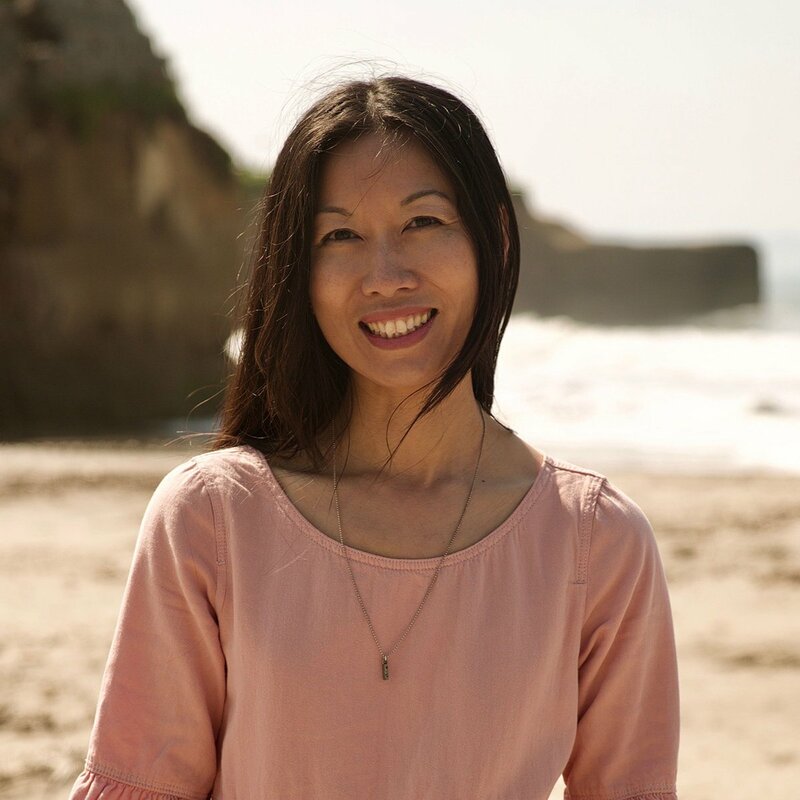 You must read what unexplicable beauty happened – you must read Lisa’s post. Lisa Leonard is the jewelry designer of the You Are So Very Loved Necklace, exclusive to sponsors using my link bit.ly/sponsorwithbonnie! ** After we prayed, I took Luis aside, with Jean Carlos translating, “Luis, don’t give up. God is at work in you. 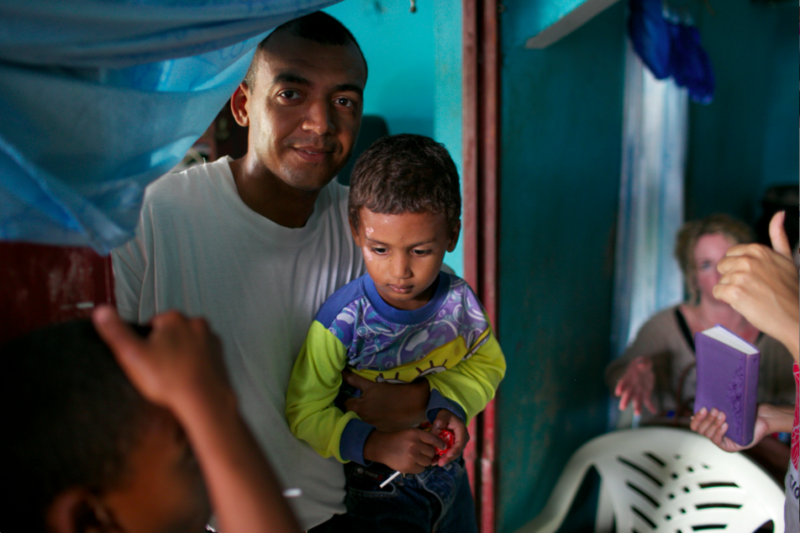 I see the love in your family.” Luis tells us it hurts to see his children suffer because he cannot provide for them. Luis says he was just crying this morning because he felt hopeless. But, as he prayed, he felt God’s peace comforting him. As Luis and I hugged each other goodbye, I walked down the hills of Santo Domingo more whole and healed than one hour ago. Sponsor a child today! 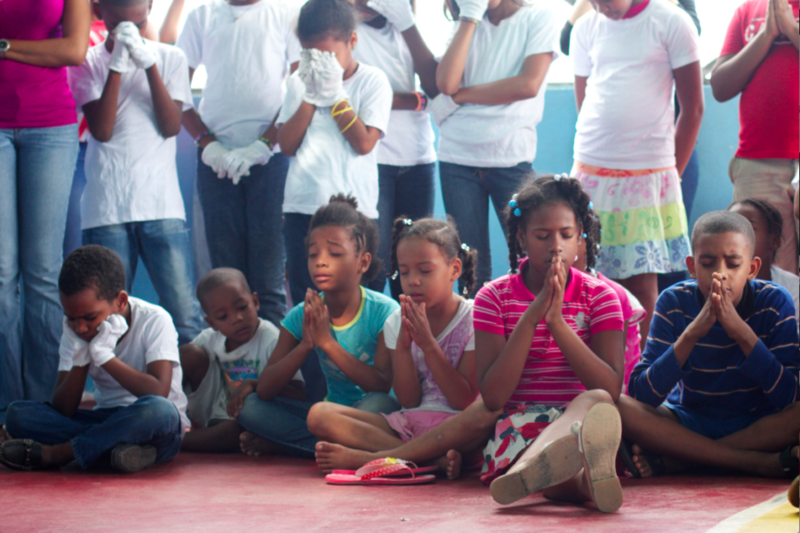 Click here to see all the chilren who are praying and waiting for a sponsor — EVERY DAY — in some cases more than a year. Let’s be God’s answer to their prayers! I love reading your posts!! Keep it up!! This was one of the verses in the Gospel today. It made me think of you on this trip. Dear Bonnie, You are doing a great job getting these Lovelight stories out to people who will pray for these precious people of God. Your photos too engender compassion. I’ll echo Gary’s post to pray for Luis and his family throughout the season of Lent, knowing the LORD meets all of our needs in His glorious riches in Christ Jesus Who encourages us to bring the children to Him. “More whole and healed than one hour ago.” Isn’t that just like Jesus?! Rejoicing with you in that truth. Step by step I am finding the same for myself. I marvel that people suffering deep poverty at the hands of greedy politicians can radiate joy and maintain strong faith. They put many of us to shame who pray for frivolous blessings. I also marvel at the way God transforms reactions. 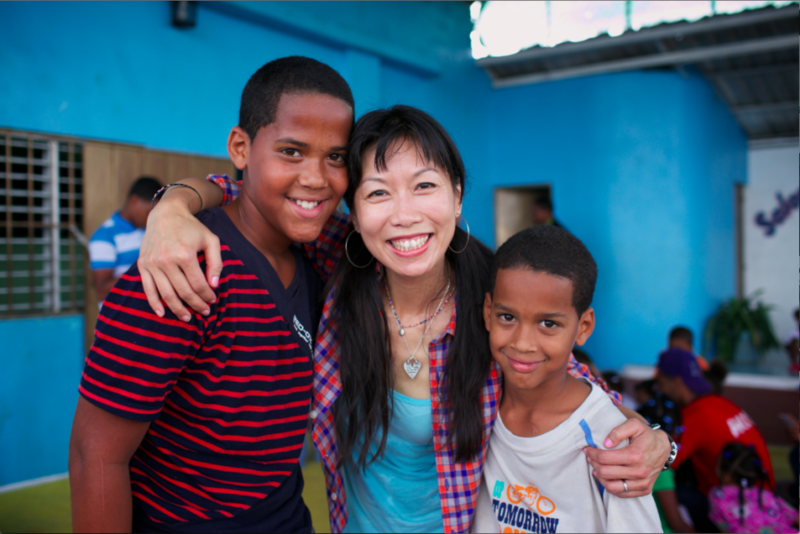 A perfect example is the way you feel honored, happy, and unworthy to be in the Dominican. I dare say, most people would not. 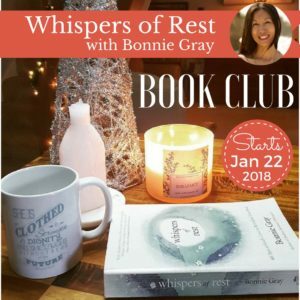 But because your spirit is in tune with the Holy Spirit, Bonnie, those emotions are coming forth. God speed as you continue to minister! 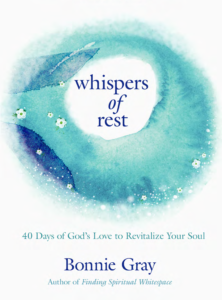 Bonnie, you are sharing of your journey and the lives of the children so beautifully – praying for you, and that God will use this journey and the stories you are sharing for His great purposes. You so are the one to be in this place at this time. I don’t think I met a father when I was there last month. There was a mom with twins whose husband was working as a barber and so was not home. But another had lost her husband just a couple of months before. Others were single moms living with parents. One of our translators told us that men leaving their families is kind of a norm and she had to learn to forgive hers. You know what it’s like to be fatherless, Bonnie. And you know what it’s like to have a Father. You are fearfully and wonderfully designed for this, and you can enter those stories. And, oh yes, I love you. I’m proud of all that you’re doing. Keep up the good work. 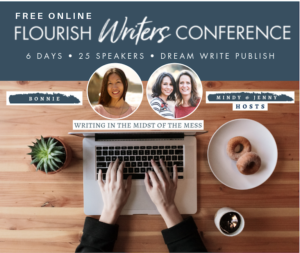 You are a blessing – not just to the people whose stories you are sharing, but also to folks like me who can’t be there but are living vicariously through your posts. Would you please send our best from Frequency to the other bloggers that are there? And let me know how we can pray for each of you.